Register Log In AmbergrisCaye.com Home Forums Nature Conch Season opens Oct 1. October 1st marks the opening of the fishing season for Queen Conch throughout Belize. 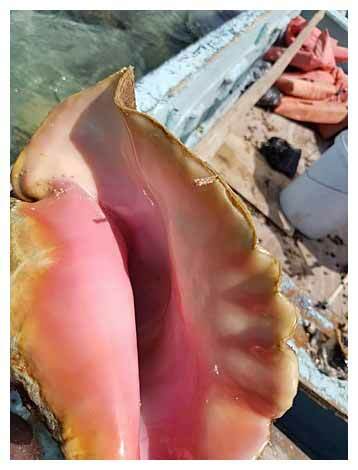 The Belize Fisheries Department advises Restaurateurs and the General Public to use, consume and dispose of all Queen Conch meat in their possession on or before June 24th, 2018. Conch season runs from October 1 - June 30th of each year. Conch is a common name that is applied to a number of different medium to large-sized shells. The term generally applies to large snails whose shell has a high spire and a noticeable siphonal canal (in other words, the shell comes to a noticeable point at both ends). In North America, a conch is often identified as a queen conch, found off the coast of Florida. Queen conches are valued for fish bait, and are also known as seafood. The public is informed that the production quota for market clean conch meat for the season 2017-2018 has been set at 884,092 pounds. The opening of conch season is from October 1st, 2017 to June 30th, 2018. The public is advised that if the conch production quota is realized earlier, the conch season will be declared closed. The Fisheries Department hereby makes a special appeal to and urges responsible citizens to call 224-4552/203-2623, email [email protected] or Crime Stoppers Belize at 0-800-922-TIPS (8477) to report any Fisheries infractions. The Department assures that all information communicated will be treated in the strictest confidence. Any person who contravenes any of the provisions of the Fisheries Act, commits an offence and shall be liable on summary conviction. *This above is in accordance with Regulation 24A (2) of Statutory Instrument No. 54 of 2012 of the Fisheries (Amendment) Regulations, 2012.